It's not Davina Porter, but a return to Outlander series (well, side series) audiobooks. The Lord John series grew out of Diana Gabaldon writing a novella for an anthology and wanting to write something with a character in the Outlander series, but not something that would interfere with the main storyline. She decided to write about Lord John, who is introduced in the second book with a minor role but shows up occasionally in the others. The book Voyager takes place over about 20 years with him offscreen the majority of the time. Perfect setting. Lord John is a member of the army and is gay in a time period where he would be killed if he was found out. The novella became Lord John and the Hellfire Club. 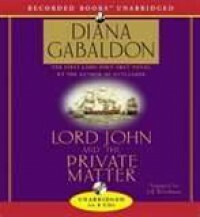 Diana Gabaldon decided to write more and ended up with this, Lord John and the Private Matter which had grown into a full book of its own. I've liked Lord John since his small role in Dragonfly in Amber and loved seeing more of him and his perspective in Voyager. He has a strong voice and character that comes across clearly in his stories. This book starts with Lord John having two problems. He is tasked with figuring out who killed a member of a regiment who may have been a spy and he noticed while in the bathroom that another man had spots on his, well, equipment. That second man is also engaged to his cousin. The two problems end up up being connected (seriously) and we follow as Lord John runs around England, ruining his clothing at the dismay of his young valet, and making friends and enemies. I haven't read Lord John and the Hellfire Club, though I bought it and the other novellas after reading this, and while you can read this on its own, there are a fair amount of references to it. I have some ideas of the plot and resolution, but I think I should still enjoy it without feeling spoiled. Jeff Woodman was the narrator, and while he is no Davina Porter, I liked his narration and would listen to more. I did buy the other novellas and one of the other books since they had a good price on the kindle and plan on reading them. I think this series will be easier to read since they are shorter (aka the length of a normal novel as opposed to the >800 page Outlander books). At least based off this one book, they are also more focused which I think I will prefer for reading versus listening.